"As long as a sanctuary city/county/state area exists where the ICE agents are turned away by their local authorities, we reserve the right to refuse law enforcement service to ANY OTHER federal agency under the Equal protection under the Law provision of the 14th amendment. These agencies that we may refuse local cooperation with include but are not limited to the Following agencies: IRS, EPA, DEA, BATF, FBI, CIA, DOD, DOL, FDA, and All Branches of the United States Military. 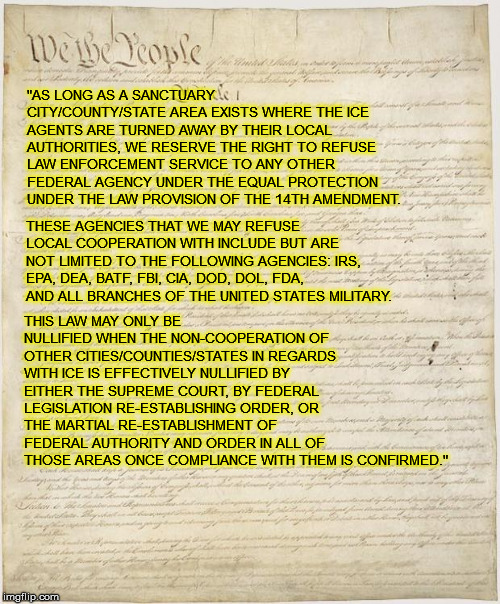 This law may only be nullified when the non-cooperation of other cities/counties/states in regards with ICE is effectively nullified by either the supreme court, by federal legislation re-establishing order, or the martial re-establishment of Federal Authority and order in ALL of those areas once compliance with them is confirmed." Basically telling the federal government that they reserve the right to refuse ALL government agencies if they so wish unless they stop the sanctuary areas from BLATANTLY breaking the law in THEIR OPEN act of rebellion. Then if nothing is done for a few months after passing this law, they can then start kicking out the IRS, and other 'moneymaking' federal organizations until they wake the hell up and DO SOMETHING about the sanctuary city problem! If they take this law and people who passed it to the supreme court instead of the sanctuary cities, you can always point out that under the "Equal Protection Clause of the 14th amendment" they have to drag THEM to court too! I think it is elegant as the law itself would self nullify once the federal government actually decided to fix the damned problem and it makes one hell of a statement. Yep, pull HUD out, stop WIC and welfare, student loans (that would actually be beneficial to them), withhold highway funding. Stop all federal aid. But, that would take a congress that was all on the same page. Never gonna happen. No, we would need the federal government to pass this law, ANY Mayor/city council, county seat or state legislature would pass this law, the same way the chuckleheads in CA and those dumb cities like Denver passed THEIR sanctuary laws. Basically this would be a case of the local government who is fed up could “play railroad crossing chicken” with the other sanctuary cities using the federal government as the train. Remove ICE and any border security from sanctuary counties and double the manpower in areas that are cooperating. Maybe I'll try to make my local town an "anti-sanctuary city." Start open carrying instead of concealed carrying. Start looking real hard at anyone who appears to be of Hispanic descent and lower economic standing, take out my phone and pretend to make a call while watching them closely - basically do everything I can to make them feel uncomfortable and unsafe. Many decades ago, some Southern jurisdictions had welfare programs that consisted of a bus ticket North. The “sanctuary jurisdictions” can only last as long as they get federal money to support their welfare programs. Cut THAT off, and things collapse quickly. Businesses only love “cheap labor” as long as they get to keep the profits, and the taxpayers have to pick up the costs. ICE should run commercials in sanctuary cities offering rewards, anonymity, and an 800 number to call for dropping the dime on the employers of illegal aliens. ICE should drastically scale up workplace raids and prosecutions of employers. Furthermore the families of those illegal alien workers should be tracked down in their homes and schools, arrested, and deported as well. I think that is naive at best. DHS can announce that, effective immediately, any employer that hires illegal aliens is subject to a $1M/day/employee fine. Use DeathCare definition of employee- 20 hrs./week. Jobs would be limited to picking crops and mowing lawns. Then, stand aside as the illegals run home. Well maybe not look a New York State..and California..
I’d like to see some congresscritter name the wall bill, The Signh Wall Bill. Let’s see the demonrats try to wiggle out of that.